Sign-Up to get your FREE printable. We've said it many times before (here, HeRe and HERE. Okay, we've said it even more than that...dig around and you'll find tons of posts about feelings, calming down and more). All feelings are okay, it's what you do with them that matters! Helping kids and teens learn how to deal with feelings pays dividends. The crucial skill of managing and resolving challenging feelings has equal importance on the playground as it does in the boardroom. 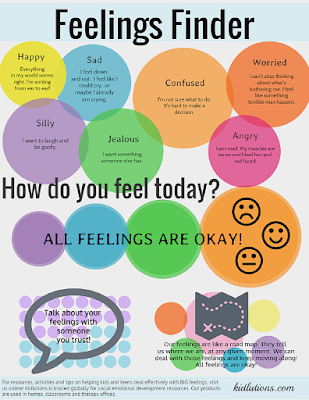 Use this graphic to help start discussions about what kids and teens are feeling. Expand upon it. All of our members (it's free to join) received a copy of this 6-page printable for FREE. You can get one, too! If you aren't a member, simply sign up here. Once you confirm your subscription, you'll be taken to the link for the download. Then, you'll get updates, freebies and more from us on a regular basis. You can unsubscribe at any time, but we hope you'll join the tens of thousands who continue to be part of our community! It's a happy place for everyone online...and we'll be happy to have you join us! Come get yours HERE! If you have any troubles, let us know. In addition to the infographic, you'll also get two pages of questions/talking prompts and a page with suggestions for use. Six total pages that help kids and teens alike. You can use it at home, in the classroom, for school counseling or in the therapy office. Kidlutions is your proud partner in emotional literacy and we're happy to reach a global audience in this endeavor. 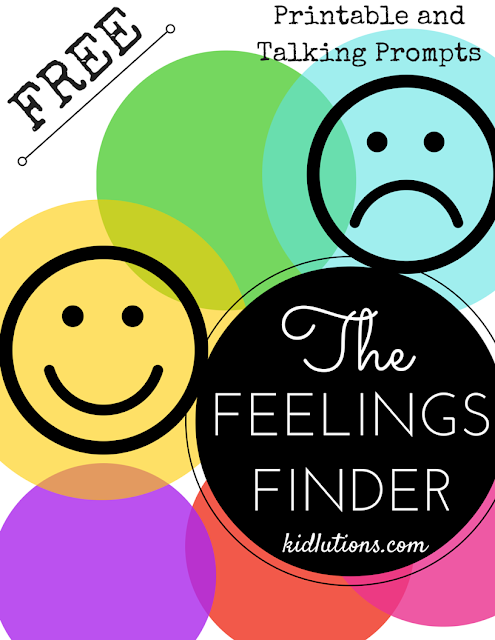 The following are just a handful of questions you'll get in our printable, to start talking about feelings with kids and teens. Do you notice how the feelings overlap each other? Why do you think that is? Can people have more than one feeling at a time? Give an example. 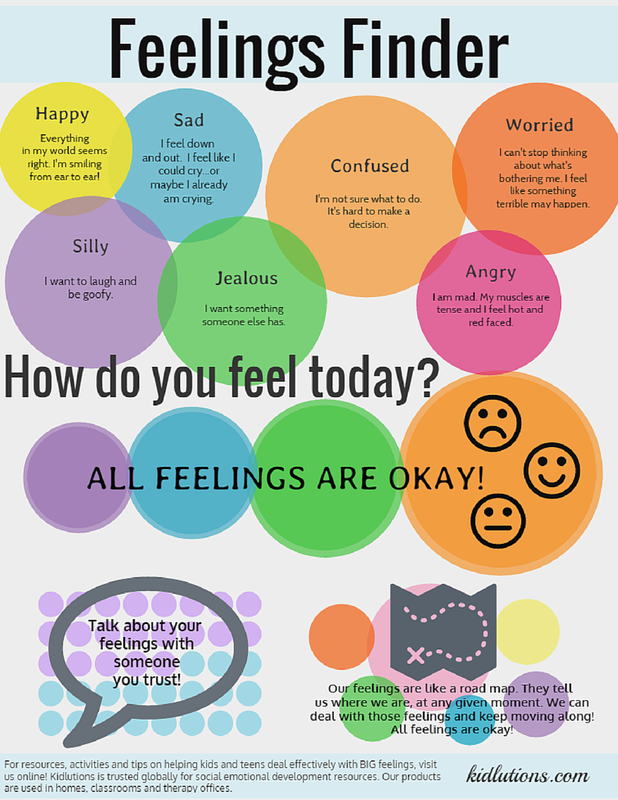 Which feelings are more difficult for you? What can you do when you have each feeling you see? For everything you need to start talking about feelings, go HERE and sign up! We hope to see you there! What else would you ask? Let us know in the comments! sorts of feelings? 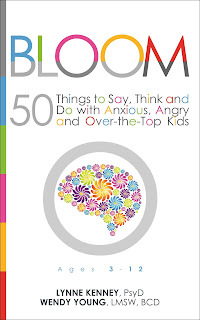 BLOOM can help parents and educators do just that!